This no bake healthy raw brownies recipe is so easy to make! It’s the best raw brownie – gluten-free, no added sugar, and deliciously unbaked! Paleo, Vegan, Gluten-Free, Dairy-Free, Refined Sugar-Free. Happy 1st Recipe of February Day!! Woohoo!! 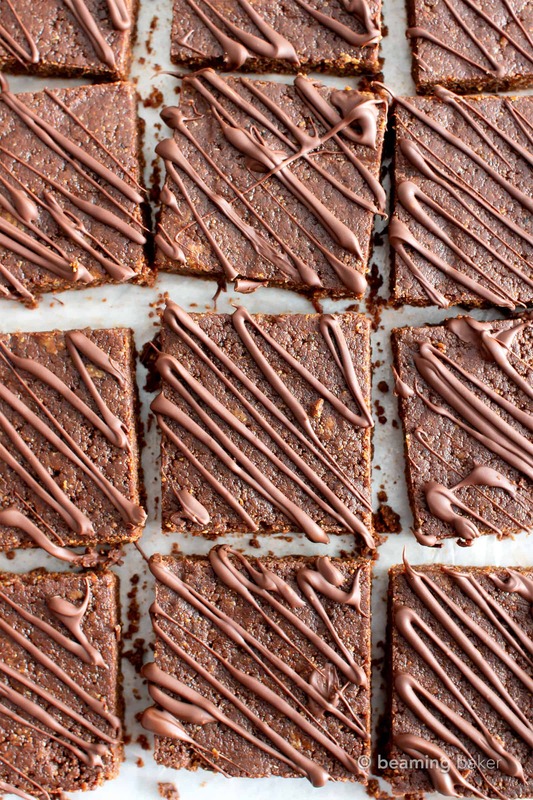 What better way to kick off the first (recipe) of the month than brownies?!? Make that raw vegan brownies. The crowd goes wild!! Why, yes, I do need to be my very own hype machine over here. 😉 ← I read that out loud and Erik started whooping for me, Arsenio Hall-style. ???? Now that January is finally over, we can put all of our bulky gym equipment away, make like 100 vegan gluten free chocolate cupcakes, cancel our shiny new gym memberships, make 200 vegan chocolate cakes, and quit being healthy!! 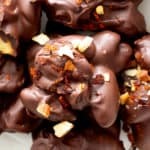 Well, February is ALL about the chocolate (and the best vegan brownies), but we need not get any whiplash whence, yep whence, transitioning from healthy-friggin’ January to chocolicious Feb. Amiright? Here’s how we’re gonna do it: BROWNIES!!! Make that healthy, raw ‘n no bake vegan brownies!! Woot woot! 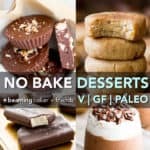 While you know I love me some baked brownies, I know, and you know, that sometimes we just need to put that goshdarn oven away (imagine if you could actually put your oven away… like where would it go??? The shoe closet?). Sometimes, ya just need to be able to no bake some raw vegan brownies. Then eat ALL of said raw vegan brownies. So head on over to my IG to sign up to be a part of my hype machine. So read my post below and be blown away by all the answers, tips, tricks, more yummy recipes, and more about this healthy raw vegan brownies recipe! Before you ask, yes: these healthy raw brownies totally (& yummily) qualify as no bake or unbaked brownies! Meaning: no baking for you, my dear! 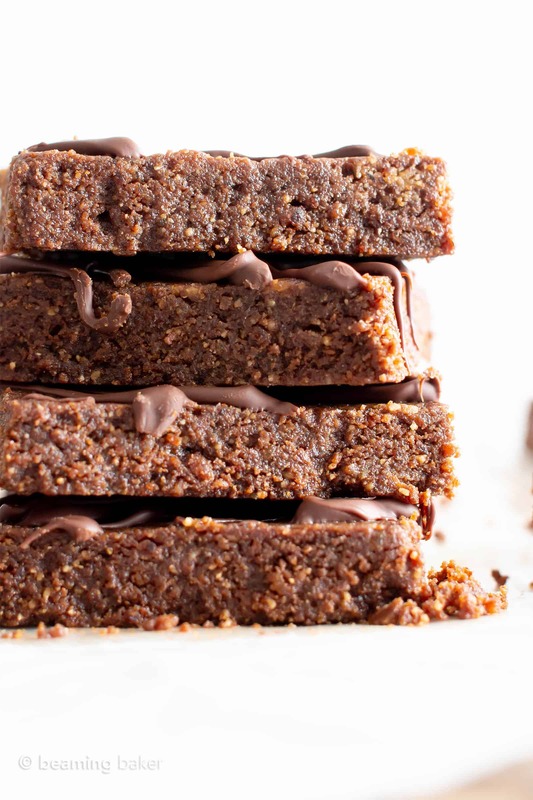 To make this raw cacao brownie recipe, simply add dates and almond butter to a food processor. Blend until you get a sticky, dough-like ball. Add almonds and blend again as directed. Then, add in the remainder of the ingredients and blend until the vegan brownie mixture is well mixed. Press mixture into a pan, chill until firm and slice! Enjoy. That’s it! How do I store these Easy & Healthy Raw Vegan Brownies? These healthy raw brownies are super unfussy and easy to store. Simply store in an airtight container in the fridge or at room temp (on the counter) for up to 1-2 months. 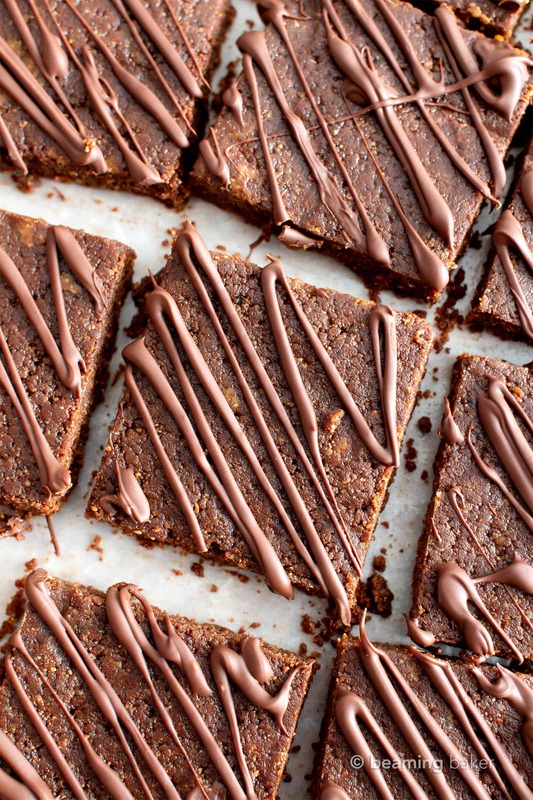 What kind of Substitutions can I make in this Healthy Raw Brownies Recipe? Can I use another dried fruit instead of dates? Yes! The flavor of the fruit will affect the flavor of the raw brownies. 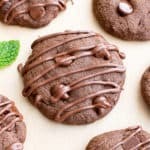 Can I use regular unsweetened cocoa powder? Yes! Medjool Dates – super yummy dates that stay fresh for ages! My Favorite Knife – my go-to knife for all baking & cooking needs. 8-inch Baking Pan – my favorite baking pan to use in so many recipes! 5 Ingredient Raw Vegan Brownies (No Bake, GF): this no bake healthy raw brownies recipe is so easy to make! 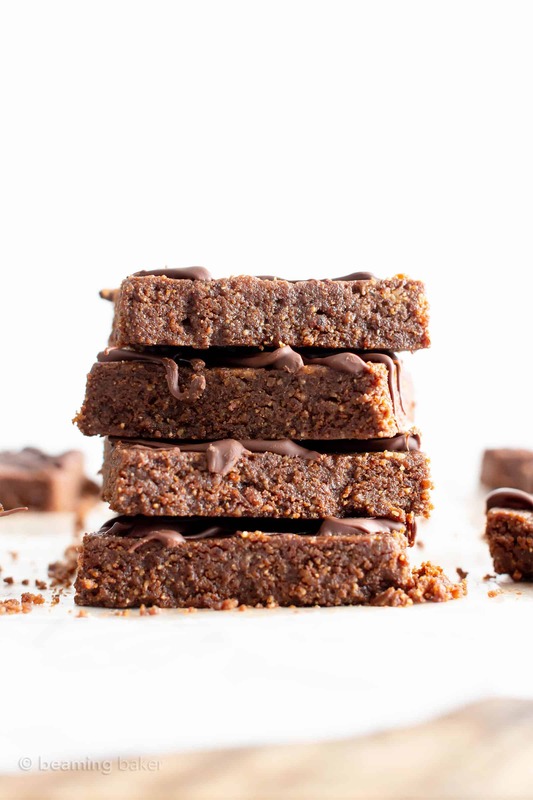 It’s the best raw brownie – gluten-free, no added sugar, and deliciously unbaked! Refined Sugar-Free, V, GF, Dairy-Free. Line an 8-inch square baking pan with parchment paper or wax paper. Set aside. Clear some room in the freezer for this pan, you will need it later. 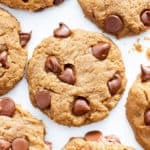 Add dates and almond butter to a food processor. 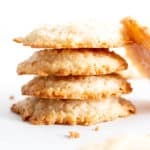 Blend until you get a somewhat cohesive, sticky mixture, like chunks of dough--the mixture should begin to pull away from the sides of the processor and roll into a ball. This will take about 2 minutes. Scrape down the sides of the processor frequently, and take breaks in between to avoid overheating. Add in the almonds. Blend until almonds are nearly pulverized—about 1-2 minutes. Take breaks between blending to prevent overheating the processor. The mixture will be soft and crumbly. It’s done when you can roll a chunk in your palm and toss the chunk up in the air a bit, and it remains cohesive. Add cocoa powder, vanilla, and salt (if using). Blend until very well incorporated, making sure to scrape down the sides of the processor regularly. Pour into prepared baking pan and loosely spread into an even layer. Once evenly distributed, use a rubber spatula to press down very firmly into an even, tightly-packed layer. Chill in the freezer for 20 mins, or until very firm. Slice into 16 brownies. Enjoy! Storing instructions below. Also try my No Bake Chocolate Paleo Almond Butter Bars and my Ultimate Fudgy Paleo Vegan Brownies. - Storage notes: Store in an airtight container in the refrigerator or at room temperature for 1-2 months. - Freezing instructions: Store in an airtight container in the freezer for 2-3 months. - Nutrition Information: is an estimate based on the best-selling, most common brands per ingredient. Also, it's estimated based on 16 servings per recipe, made without salt. ???? 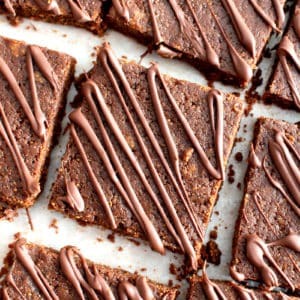 This is exactly what I need right now, chewy, dense and chocolatey without the guilt of a box of Ghirardelli. I’m sold! Haha oh you know it Lisa! ???? Hope you enjoy these brownies! 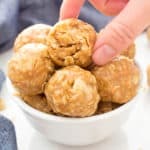 Great recipe, love that it is vegan and my family couldn’t even tell, ate them all right up! Woohoo! That’s so awesome to hear Noelle! ???? These are crazy good! The dates bring a lot of texture and flavor for sure. Curious now to try this exact recipe with other dried fruits. Looking forward to experimenting! Yay! So glad to hear it Mike! Let me know what fruits you try! ???? Yes, dates are so great to work with! Haha, love it! ???? I love making no bake desserts and these brownies sound perfect – a must make for my chocolate loving husband!! They’re seriously so good! I think your hubby is gonna love them! These look amazing! Thank you for sharing !! You’re very welcome Amanda! ???? Brownies are my absolute favorite but I’ve been trying to eat healthier lately, so these were perfect! Thanks!! 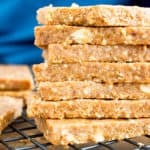 Yep, it’s the perfect healthy sweet treat! These brownies look like the perfect grab and go sweet treat! Look amazing! I wouldn’t be able to stop snacking on these! I want to try these asap! Yes! They’re soo good! ???? I have to try these soon! They are faaantastic!! Yes you do! ???? Thanks Katerina! Hi Ronnda! Yep, that would work perfectly. 🙂 Hope you enjoy them! They look incredibly delicious! 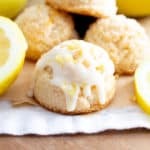 Need to make a batch of these, this recipe is a keeper! We made these today and are absolutely obsessed!! Woohoo! That’s so wonderful to hear Jessica! ???? Demeter, these are fabulous! I’ve had other raw brownies, but with a different texture. This is moist and very close to seeming like it was baked—I’m not sure I would have picked up on them being raw brownies. 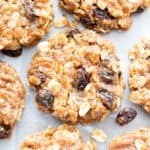 A lot of other recipes use walnuts, which are okay and healthy, but not my favorite. And none use almond butter. So good, so easy to make. Your directions were perfect. 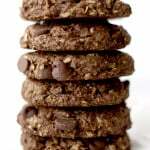 My only tweak was to place cacao nibs on them for decoration and added nutrition and crunch.